Built on the layout with 5 reels, 4 rows, and 40 fixed paylines, Goddess Rising is the Ancient Egypt-themed progressive jackpot video slot machine you can play around landline casinos powered by Novomatic. On the other side, desktop and mobile gamers can refer to Greentube’s version playable across multiple devices without a need to download the iPhone app or the Android .apk file for this purpose. Following the story of a fearsome yet beautiful goddess, the game allows more than a few betting opportunities, depending on your ambitions or experience. Naturally, the paytable is crowded with themed symbols and you need to line up 3 or more standing side by side on adjacent reels in order to get paid. 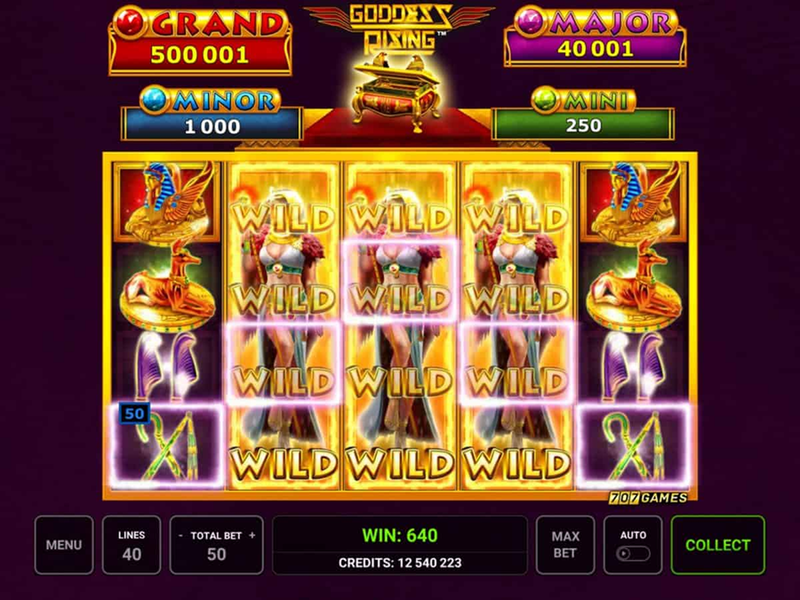 The game is additionally powered by Wilds, Scatters and Free Spins, so let’s see more details. With 3+ Scatters appear anywhere on the reels, you will initially receive a batch of 12 Goddess Rising Free Spins enhanced by Expanding Wilds. They will transform all lower-paying items such as Jacks, Queens, Kings or Aces into Sphinx, Blue scarab, cane, and feathers. Speaking of which, the Sphinx pays a maximum of 160x your line bet, while playing cards may produce 4 to 28 coins for combinations of 5 of a kind. Finally, with 1, 2 or 3 Wilds landed on the reels, lucky winners will claim 1, 3 or 5 extra spins, respectively. During the Goddess Rising Bonus round, lucky winners will additionally benefit from the Expanding Wilds that reveal another screen with 12 coins. This is a classic Pick & Win Feature where 3 symbols of the same kind with the same type of jackpot associated reveal 1 out of 4 progressive jackpots – Mini, Minor, Major or Grand jackpot. The last-mentioned is the fastest way to the big win of 100.000 coins. Unfortunatly, we have no free play mode for Goddess Rising available. Check out the screenshots below and hop right into action with one of the recommended casino sites!